While there is a place to blog on your website, the homepage is not the spot. Your homepage needs to professionally guide visitors into your product or service funnels. Sharing value in your blog is supplemental. What’s the solution? Keep your homepage clean by removing blog content from it and instead including a link to your blog in your website’s navigation, where visitors can easily find it. But still make sure to publish regularly. See Why reports that 99% of prospects won’t buy on their first visit to your site. They may plan to return, but if there’s no new content drawing them in, they’ll likely forget. You want to optimize your page for conversions and less, more powerful copy does that. An NNGroup study found that copy including half the word count showed a 58% rise in usability. Use just enough of the right info to help visitors make the decision you want them to make. What’s the solution? Keep your copy concise. It’s no secret that visuals capture our attention and inspire an emotional connection. Today it’s all about getting noticed and creating a deeper engagement. Our brains process visual information 60,000 times faster than text alone. No wonder apps like Canva are so popular these days. They allow the layman to design graphics that combine text and images in beautiful ways. What’s the solution? Take advantage of design apps to create images that your audience will engage with and remember. Again, the purpose of your website is to convert visitors to customers. To do that, you need to lead them into your funnel with a CTA. According to Online Marketing Coach, 70% of small business websites don’t have clear homepage CTA, and it’s hurting their businesses. What’s the solution? Include a clear call-to-action button that takes users less than three seconds to spot. But don’t overdo it. Dayne Shuda notes that too many buttons can discourage users from making a choice. Be specific and give an incentive to act now, whether it’s a bonus, scarcity, or a time crunch. Writing for the web is not akin to writing for a high school research paper. If you use too much jargon or complicated words, you risk losing your readers. What’s the Solution? Use a service like Speechpad to transcribe your verbal thoughts and then plug the copy into the Hemingway App, or use the Grammarly plugin, to check your writing for errors and readability. Learn how to format your copy by bolding and adding bullets before posting it. Of course, none of these solutions will be as effective if your copy isn’t benefit-driven. Learn what’s causing headaches for your ideal customer. Then introduce their problem, agitate it, and then share how you will solve it with the benefits they’ll receive through your products or services. Finally, substantiate your claims with features. People want to see that you recognize what’s wrong in their lives, that you can fix it, how much it will cost them, and how long it will take. Have answers to all of their questions so that they don’t have a reason to say no. Combine these solutions with benefit-driven copy and your website will be a hub for consistent conversions rather than a harbor for conversion killers in your copy. So what are you waiting for? First, share this article with your marketing and sales teams. Share it with your social media followers. 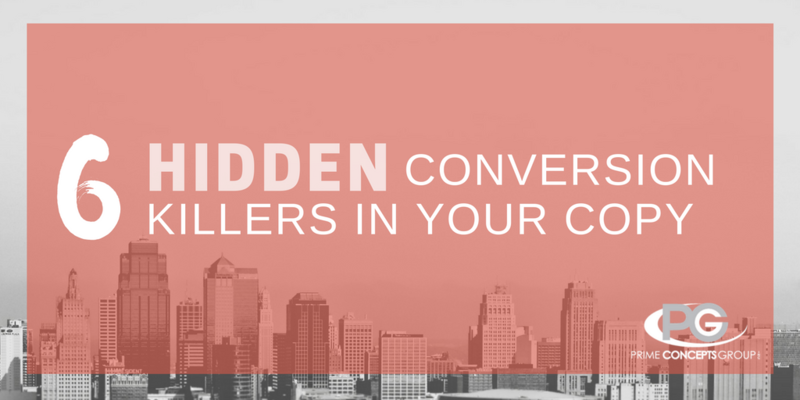 Then, print it out and use it as a guide when avoiding these conversion killers in your copy. Have additional insights or questions? Let me know us know in the comments below.